Bang Bang Tofu lives up to its name – it has a nice kick to it! I serve it over rice and it makes for a very filling (and spicy) meal! Many people aren't comfortable cooking with tofu. I used to be one of those people. Once I started experimenting with it and trying different recipes, it has become a staple in my family's diet. Tofu takes on the flavors and spices you add to it. You would never want to eat a block of tofu plain – blech! The key is spicing and saucing it up! Tofu is zero Points under the WW Freestyle plan and one worth trying out sometime! 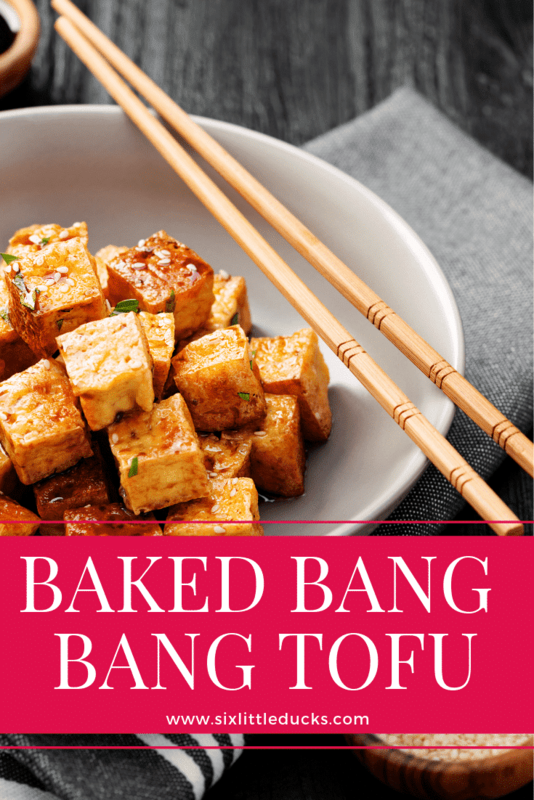 This Baked Bang Bang Tofu recipe will make you a tofu lover full stop! Preheat oven to 375 degrees Fahrenheit. Line baking sheet with parchment paper and set aside. Remove tofu from packaging draining out all water. Place Tofu in either a tofu press (if you have one) or wrap in a dish cloth and press between two cutting boards with something heavy on top, e.g. books, heavy skillet, weights, etc. Press for a minimum of 20 minutes to get as much water out as possible. In a small to medium bowl add flour, garlic powder, onion powder, and water. Stir until thoroughly combined. Should resemble a batter. Do not make the batter too thick, it should resemble pancake batter. In a second small to medium bowl add the Panko crumbs. Slice pre-pressed tofu into 1 inch cubes. Dip each cube into the flour mixture first, then the Panko, then place on prepared baking sheet. Repeat until all tofu has been used. Place in oven for 20 minutes, keeping an eye on them so as to make sure they do not burn. At 20 minutes, flip cubes over and bake for another 20-25 minutes. Your baking time may vary depending on your oven so pay close attention while they are baking. While tofu is baking, prepare sauce by combining Mayonnaise, Rice Vinegar, and Sriracha in a medium to large bowl. Whisk until ingredients are thoroughly combined. 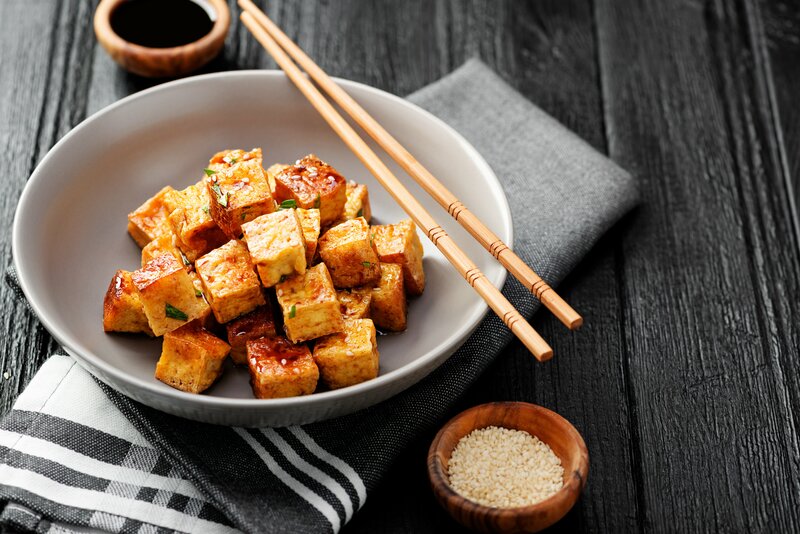 When tofu is finished baking, add cubes to bowl with sauce in it. 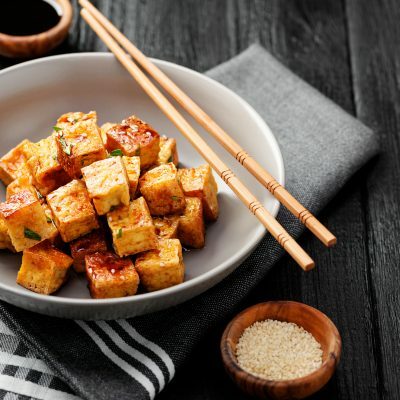 Toss tofu with sauce until all cubes are thoroughly covered. Serve immediately, either by itself or over rice. Tofu Substitute: If you're still not ready to try tofu, you can easily substitute shelled and de-veined shrimp in equal amounts, i.e. 12 ounces tofu = 12 ounces shrimp.